When buying a car in Missouri, you must obtain certain documents from the seller in order to register and apply for a title in your name. The documents that you need include the bill of sale and vehicle title. You will use these documents to register and title the car you have purchased with the Missouri Department of Revenue (DOR). If you buy a car from a vehicle dealer, they will handle required paperwork for vehicle registration and titling for you. However, if you buy from a private seller, you will need to obtain certain paperwork from the seller in order to register the vehicle in your name. Continue reading this article to get more information about the paperwork required when buying a car in Missouri. Vehicle Title: It must include your signature, the seller’s signature, purchase date, purchase price, odometer reading, vehicle description and information about lien (if applicable). A Missouri Bill of Sale (Form 1957) if there is no price information on the title. A Notice of Sale or Transfer (Form 5049). An emission inspection if you live in Franklin County, St. Louis City, St. Charles County, Jefferson County or St. Louis County. VIN/odometer inspection if the vehicle was purchased from out-of-state. A completed Form DOR-108 (Application for Missouri Title and License). A statement of non-assessment or copy of your property tax receipt. Payment for fees and taxes: $8.50 title fee. $2.50 processing fee. Registration fees. Sales tax: 4.225% of purchase price. You can transfer license plates from your old vehicle to your newly purchased vehicle. A safety inspection certificate dated within the last 60 days. $5 Permit fee and additional $3.50 processing fee. Vehicle fraud in Missouri can come in form of forged documents, odometer tampering and misleading information. If you suspect or become a victim of any fraud, contact the Attorney General’s Office in Missouri or the DOR to have the issue investigated. 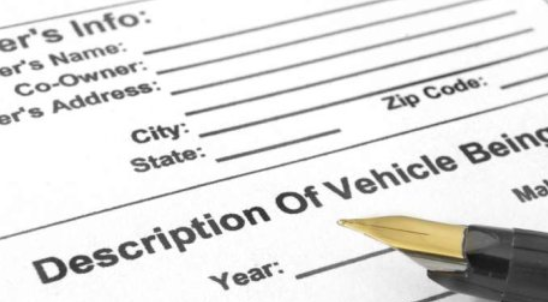 A vehicle history report is not needed when registering or titling a car in your name. However, this document is needed when purchasing a car. From this report, you can get detailed information about the vehicle that you are buying, such as damage history, accident history and odometer reading.